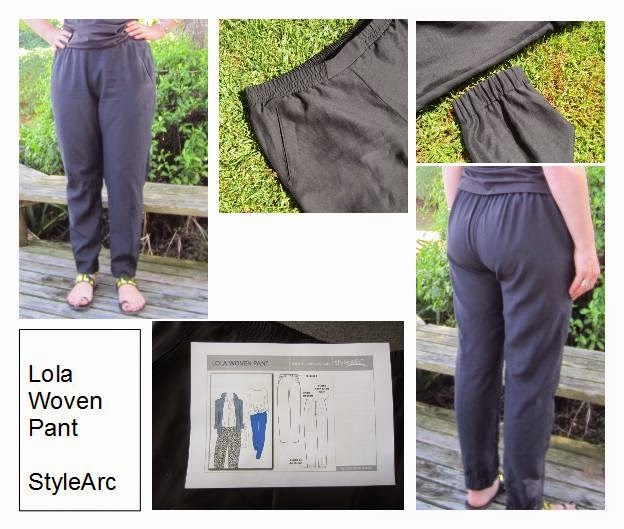 I've spent a lot of time looking at the StyleArc website, I like the look of quite a few of their patterns, but have always hesitated to buy any. However they recently started selling pdf versions of some of their patterns through etsy and I finally succumbed and bought the Lola pants pattern. The pdf is very simple to put together, the only problem I experienced was that my printer printed the watermark logo over the pattern instead of behind it which meant that parts of the pattern outline were missing. However I contacted StyleArc about this and within a day they had sent me a copy that worked with my printer. This is a basic pant pattern, with an elastic waistband and elastic at the back cuffs. The instructions for the pockets are very basic, I stitched around the pocket opening to make it look neater. A suggested option is to sew zips into the pocket openings. I made a size 14 but ended up upicking the waistband and cutting the elastic down to the recommended length for size 12 as the pants were too loose around the waist. I'm not totally sure about the fit of these pants but they are comfortable to wear and I think they are a good casual pant.